Yes, it was last weekend and I’m told that this year the fans watching the Super Bowl exceeded all previous years. It’s a pity there wasn’t actually a game. While not big football fans, the fact that I grew up in Denver and the darling husband went to college in Seattle figured into our weekend. Rather than contemplate where to watch the action, our other pressing need was how to use up an over abundance of radishes. Last year, at the same time I posted Radish chips which were a hit but we’re both working towards lighter menus and frankly, lighter bodies. It’s also the time when greens are prevalent in our farms and in particular, mizuna, a Japanese mustard green. The combination of radish and mizuna while tasty, delivers a high impact punch of vitamins A, K, and C. These are essential for many of the body’s systems including the immune, vision, reproductive and skeletal. In addition, vitamin K is also essential for blood clotting. After the chopping, this salad slides together with remarkable ease and disappeared quickly in my house of boys. 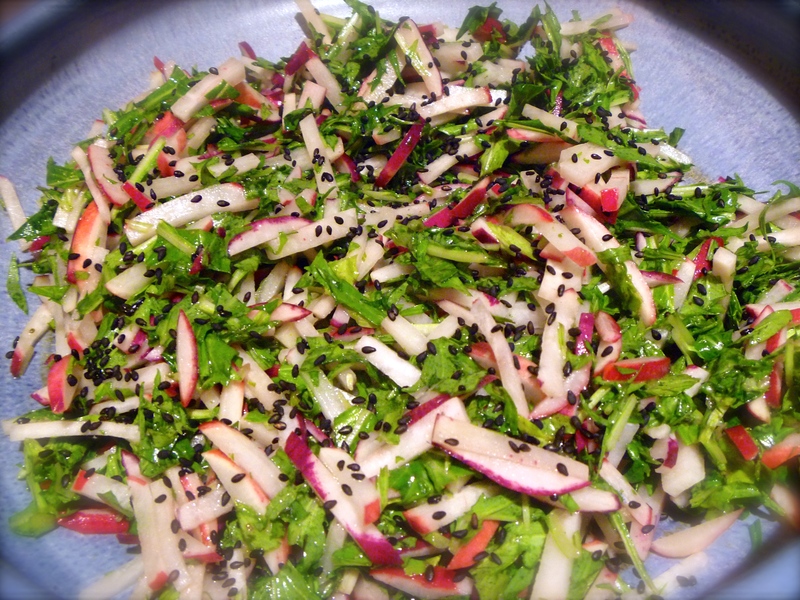 Mix together the radishes, mizuna, rice vinegar, oil, lemon juice, and salt in a bowl. Chill in the refrigerator for a minimum of 30 minutes. Top with sesame seeds just before serving. Just a word to set expectations: I’m embarking on a plan of study for the next four months which will likely cause me to be here a bit less frequently. I’ll attempt to post our seasonal meals but you may miss out on the research or back story that I typically work to create. In addition, if I run across any fascinating community building concepts in my pursuit of Economic Development certification, I’ll be certain to share. Thanks Judie. The pass rate is really low so it is going to be a lot of work. Me to, WISHING YOU SUCCESS! You always transform us somehow and we are anxious for new information. Keep it up and us informed! Thanks Sally. As always, I’m hoping for a revelation or two that will expand my thinking. I’m sure If eating rashes would have meant the Bronco’s won there would now be a radish shortage in Denver! Don’t you know it. That was just the worst! The salad is worthy. The game, not so much. Nice salad Tammy – had to look up mizuna on your cool nutrition source, thanks! I’m feeling green starved here under our ten inches of snow and ice… still signs spring is coming though. Good luck on your studies, sounds like an interesting program. Gosh, we have to think of a plan. I’m drawing in bok choi, tat soi, lettuce, spinach, mustard, mizuna, collards, kale – can’t have a meal without them. Even my children loved this salad. You might be surprised. The Sea Hawks definitely brought their “A” game to the stadium on Sunday. Tammy, I’m so excited for you. New challenges, new directions. thanks for this beautiful salad. Who says good for you can’t be beautiful and tasty too? Despite the chopping, the salad is easy and so delicious. Salad looks delish! And I know you are going to TOTALLY rock your studies! I hope so. There is so much to accomplish before hand. What a beautiful salad! Good luck with your course of study! haha. I’ll know you’ve been successful when they’re selling radishes on the futures market. What a great looking salad. Super, indeed! A simple and pretty salad. Good luck with your endeavors! A lovely colourful crunchy tasty salad! Yum Yum yumm! I didn’t know this name of mizuna, we call it Mustard salad leaves & I love them too! Yes, it is a variety of mustard but not very common here. I like it a lot. Tammy, all the best on your studies. We will take what we can get of you through your enticing and healthy food blog! Very kind of you Tandy. I’m a bit intimidated about the whole thing. The study sounds exciting, Tammy, and the salad looks just wonderful. the colours are so exuberant. All the best over the next few months! Tammy, I wish you well in your endeavors. I hope the healthy diet shown by these lovely-looking radishes will help you power through! The salad looks great–my last attempt at Asian slaw failed, so this looks good for a second try. Good luck in your studies! Best of luck– look forward to hearing about interesting concepts from your studies! I’m also impressed at your “hot” tolerance as I find both radishes and mizuna to have a such a substantial bite that I typically dilute them both. Aww, that salad looks wonderful! I love it’s inspired by Japanese flavors! What studies are you going to do?